(top) The first of the 'styled' Perfexes was the 44, in production only during 1939 and part of 1940. It offered all the features of a Contax III (the most expensive 35mm RF camera in the world) for under $40. (center) The Perfex 55, in production from 1940 to 1947, was the most successful model and is therefore the most common today. (below) In 1941, a lower-priced model was introduced. Called the 33, it was a Model 44 with the slow speed system removed. It remained in production until the beginning of the war and sold for $29.50. One of my favorite American 35mm cameras, the Perfex brought an astounding array of state-of-the-art features within the reach of the average American 'serious amateur' photographer. 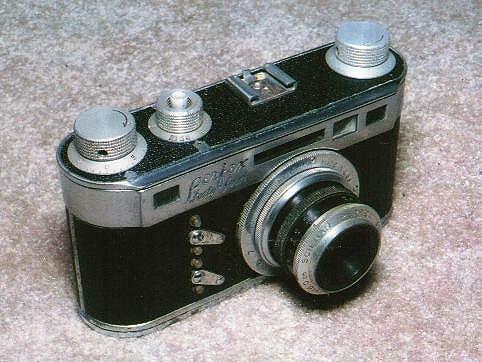 Introduced in 1939 at $37.50 with an f/3.5 lens, the Perfex 44 shared time and price with the Argus C3. In addition to matching the C3's features (coupled RF, flash synch, interchangeable lenses), for an extra $7.50 the Perfex provided 4 additional shutter speeds, a built-in light meter and much easier handling. The rule in 35mm camera design in the late 1930s, generally speaking, was to copy, however superficially, the features of either the Leica or the Contax. 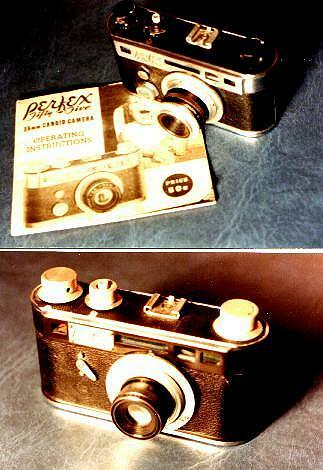 The Perfex, somewhat similarly to the Nikon of a decade later, tried to combine them both. Now it may seem that combining the best features of two $200 cameras into one costing under $40 would be a touchy proposition for a company that had been in the camera business for only one year, and in fairness I have to admit that the Perfex had its problems. On the other hand, my '55' performs faithfully at all speeds (most of the time) after sixty years.... how much more can you ask at that price? After experiencing a modest (and undeserved) degree of success with the Perfex Speed Candid in 1938, the Candid Camera Corporation immediately set about designing the 44. The feature selection, lifted variously from Leica, Contax, Exakta and Univex, was well chosen. From Leica came the cloth focal plane shutter with rotating dial (but the Perfex shutter dial rotated during winding, not during exposure - a better arrangement), the rounded body shape, the separate viewfinder and rangefinder and the one second slow speed. (This was, by the way, the first American 35mm with a full range focal plane shutter. The only others I know of were the Detrola 400, Kodak Ektra, B&H Foton and Premier Kardon, all of which are unobtainable rarities today). The actual mechanical design of the Perfex shutter, while not as unique as, say, that in the Univex Mercury, was no slavish imitation; it was unique and clever in many respects, and it's unfortunate that a full discusion of it is a bit beyond the scope of this article. From Contax came all shutter speeds on a single dial (although the Perfex required a fast/slow selector like the later Contax S); the top shutter speed of 1/1250 second (okay, it was no more honest that Zeiss-Ikon's; but it gave a decent 1/1000), removable back and the possibility of cassette to cassette film loading, the wide base rangefinder and, after a fashion, the built in light meter. Some of the 44's shutter design also is reminiscent of the Contax, in particular the slow curtain travel at slower speeds and the pre-setting of the slit during winding so that both curtains travel together. Exakta donated the wind-up slow speed mechanism in the later 55 and DeLuxe models, and the Univex Mercury provided the hot flash shoe. Like the Contax, the focusing helical was built into the body rather than the lens; but with the Perfex there was no cam arrangement to make it work with non-normal lenses, making telephoto work a genuine ordeal with the 150mm lens offered. The quality of the lenses was consistent, in the sense that I don't think there was ever a good one, at least until Perfex changed from Graf to Wollensak optics late in the series. I don't really have enough experience with them to be sure, but I don't think the lenses were truly interchangeable: each lens was equipped with an infinity-adjusting feature, which I am inclined to believe was used to correct for part-to-part variations in film plane registration in the bodies (unlike most cameras, the Perfex film plane was a very thin sheet metal stamping attached to the shutter module with screws - there was no direct, precise control of the film - to - lens mount distance). While a very nice and fairly unique mechanism, this adjustment of individual lenses would not be conducive to a lot of lens swapping. After the dramatic advance from the crude and nearly unusable Speed Candid to the sleek 44, Perfex design became very evolutionary, not to say glacial: the only difference between the 44 and the 55 was the slow speed control; the 33 was a 44 with the slow speeds removed; after the change to Wollensak lenses, the 22 was introduced, a 55 with the old Graf lens (probably to use up the stock), and after the war the extinction type exposure meter was removed from the 55. The most dramatic change was the Perfex DeLuxe, introduced in 1948; but this was really just the 55 internals mounted in a stamped rather than diecast body which was supposed to be better quality but didn't look as nice as the earlier models. By the time the DeLuxe came out Perfex was on the ropes in any event, and not many were made before the parts were scrapped out and built into cheap leaf-shuttered cameras called 101 and 102. If you're looking to pick up one of these overlooked gems, the 55 is by far the most common and will probably give the best service as well (but don't sell your Nikon). Models 22, 33 and 44 all appear to be about equally scarce and tend to cost about twice as much as a 55, and are probably somewhat less reliable due to greater age and a less developed mechanism, while the deLuxe is a bit more rare again but may provide a little better service and will definitely have a better lens. All in all, they may not be quite as reliable as a Kodak or Argus, but they sure are a heck of a lot more interesting.